I have a bad habit of staying up very, very late when I'm alone in the house on the weekend, like this one. Tonight I had just lain down to sleep at past 5 in the morning when I heard some loud but muffled noises, as if my downstairs neighbor had woken up and started slamming closet doors. Then something much louder, like something heavy dropping in the street outside my window. Suddenly September 11th crossed my mind, and I dismissed that thought as ridiculous. Then came lots of excitable young men's voices right below my window, in distinctly non-local accents, and crashing noises. And what sounded like gunshots. Several. Then a loud thump followed by a whooshing noise. I sat up and looked at the window to see flickering reflections reaching high into the trees. A dozen or more jeunes from the banlieue were calling to each other and running toward the light. I ran to get my camera and opened the balcony door, but when I leaned out to take a photo, one or two of them looked up at me. I saw one young man running with something in his hand. It was a pistol. I suddenly felt a cold chill. My teeth started chattering, my legs started trembling and I couldn't stop them from shaking. They were blowing up cars right under my window. I went to the back of the apartment without turning on the light in front, and called the fire department on the 18 line for emergencies. There was a short message telling me my call would be recorded, and then someone came on the line. "Les pompiers sont au courant, madame, the firemen know about it, ne vous inquiétez pas." Five long, long minutes went by. 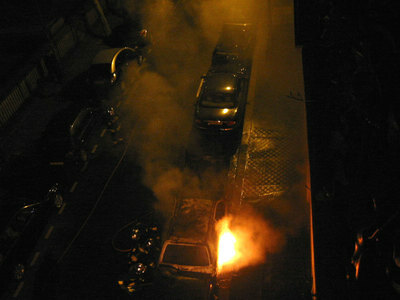 I had plenty of time to think how there was no exit to my building except past the burning cars and angry young men. Earlier this week some of them set fire to a crippled woman getting off a bus (she was saved by the bus driver, a brave man). I could hear snickering laughter and glass shattering. I didn't poke my head out any more, but I could see the flickering light rise higher and brighter. Thump--whoosh! again. How many cars were they lighting up? What about my car, my darling little car? (I didn't have a car for so long, years and years after everyone else. It means freedom to me. I love my little car.) Oh my God, what about the five children in the ground-floor apartment-- one bedroom three meters away from the crackling flames? How terrified they and their parents must be! The pompiers still had not arrived. I called the police on 17, their emergency line. "Ne vous inquiétez pas, madame, on est sur site." "But there's no one here!" I said. I stuck my head out far enough to see that the jeunes were still enjoying themselves, although warily. They had to know that dozens of people from all the buildings around were phoning the police and firemen. They were not on their own territory. No, this is embassy and consulate and haut fonctionnaire territory. They knew what they were doing. "Ils arrivent. On est au courant. 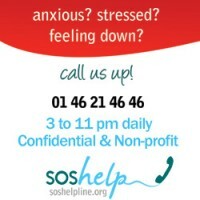 Ne vous inquiétez pas," said the calm voice of the policeman on the emergency line. I realized that one or two ordinary policeman could not just show up to face two dozen young men alone. I hoped the firemen would show up first-- the jeunes like the firemen. In fact, several of those who were arrested for setting fires in the past week have admitted to wanting to be firemen themselves. Still, when the noise and flickering flames continued unabated, I called my local police station (which, as far as I can see, does nothing but take burglary and lost-wallet reports. They always say they can't help you and tell you to call the Centrale). "Do you know that there is a bande de jeunes burning cars on my street, in front of my door?" I demanded. "Ah bon?" said the policeman who answered the phone. Someone else grabbed the phone. "Oui, oui, on est au courant. Ne vous inquiétez pas. Ils arrivent. Ils arrivent." A sudden silence had fallen. I gathered the courage to go out on the balcony and saw a big fire truck blocking the street. The jeunes had vanished. Six or seven firemen surrounded the car-- after all that, it was just one car on fire; the one right behind it, which was parked touching its bumper (I told you the French park badly), was destroyed as well. As I watched, the pompiers smashed its hood to try to get it away from the burning car. My legs were shaking and it was really too dark to take pictures, but here is one. On the other side of the street, a policeman was interviewing one of my neighbors with a notebook, but not far away, two more jeunes looked on sardonically, grinning a mile wide. One of them pointed at me. I tried to look unconcerned, disinterested. They were standing right next to my little car. I was amazed at how long it took to put out the fire. It went on burning till the car was a carbonized hulk. Each time it looked as if it were out, more flames would suddenly burst from underneath it. The other thing that amazed me is how I could not control my own limbs. The only other time I have felt suddenly cold all over and trembled like that was watching the September 11th attacks on a television set in London. It didn't help to tell myself to act brave. I set my teeth (I know what that means now), I told myself I wasn't a coward, but the legs had their own ideas. It was exactly what our Indian friend, the bride's father, told us happened to him once when he was being stalked by a tiger. "I said to myself, I want to die as a brave man! I will not be afraid! But my legs just kept trembling by themselves." I don't feel quite so sympathetic to the jeunes any more. Oh no - how frightening! I had read that they hit Paris last night. What arrondisement is this in? I've been listening to this on the radio this morning and feeling very removed from it all - in fact ended up discussing the riots we had in the 80's in England. Then I read something like this, which is so personal and realise that it's not just something on the news - it really is happening. How very frightening for you - I hope you feel less shaken now. Hope you are calmer by now... when my wife and I had our honeymoon in Paris, we also got into a riot, almost squished hen we tried to enter a metro station and teargassed later. Wow! That's definitely too close for comfort. I surprised a burglar once so I understand about shaky leg syndrome. Let's hope the authorities get this under control soon. -- and "experience" ( = real life). Moving account, thank you. As is my custom when I read something I like, I went on poking around your blog and tagged it. You have a keen sense of time and place and your personality shines through. Unfortunately, it took a frightening encounter for you for me to discover this. I came here through a link from another blog. Thank you for sharing this harrowing story with your readers. It really hits home when you get a direct perspective on what is actually happening in Paris. Hope you are OK. Is there a safe place where you can put your car until the unrest dissipates? Sounds like a total nightmare. Thanks for the post. Be safe!! All the emergency numbers (15, 17, 18) actually go to one central operator that will reroute you to the appropriate service. My gosh. Please be safe! I can't believe what's going on. These jeunes are using any excuse to be bad and it's gone on too long. I work in Villepinte and go through Seine-Saint-Denis and Aulnay-sous-bois and I see what the jeunes are doing. I'm scared on the trains, the RER B stopped running at 17H30 today. That was a mini rant... whew. I can't believe that's happening outside your window. I hope this mess stops soon. From Sedulia: The American embassy is recommending not to take the RER B to CDG airport until further notice. It's been attacked a couple of times. It was very interesting to read your story. Good luck from Austria! Thank you for the report. We are planning to travel to Paris on the weekend. Can you advise us wether or not you feel this is a good idea or not? It is extremely hard to filter the news we are seeing/reading in North America. Be well. Some friends of mine are coming too. I think there's no problem and you shouldn't worry. The things you are seeing on television are not happening in downtown Paris, which is crawling with cops and soldiers (and has been for years, by the way). However the U.S. embassy is recommending that people take the bus or a taxi into town, and not the RER B train because it passes through some of the "sensitive suburbs."